Latex Surgical Gloves Sterile LP, 50 pairs/box Sz. 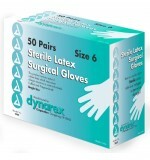 7 ..
Latex Surgical Gloves Sterile LP, 50 pairs/box Sz. 7.5 ..
Latex Surgical Gloves Sterile LP, 50 pairs/box Sz. 8 ..
Latex Surgical Gloves Sterile LP, 50 pairs/box Sz. 8.5 ..
Latex Surgical Gloves Sterile LP, 50 pairs/box Sz. 9 ..